Here are a few things that recently caught our attention. 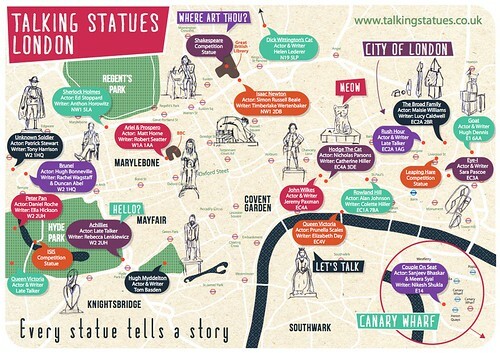 Map for ‘Talking Statues’ designed and illustrated by Alice Roche. Top: spread from Random Spectacular no. 2 by Mick Manning and Brita Granström. Large format magazine Random Spectacular launched in late 2011 (see ‘Noted #29’ on the Eye blog) with all profits going to Maggie’s Cancer Caring Centres. 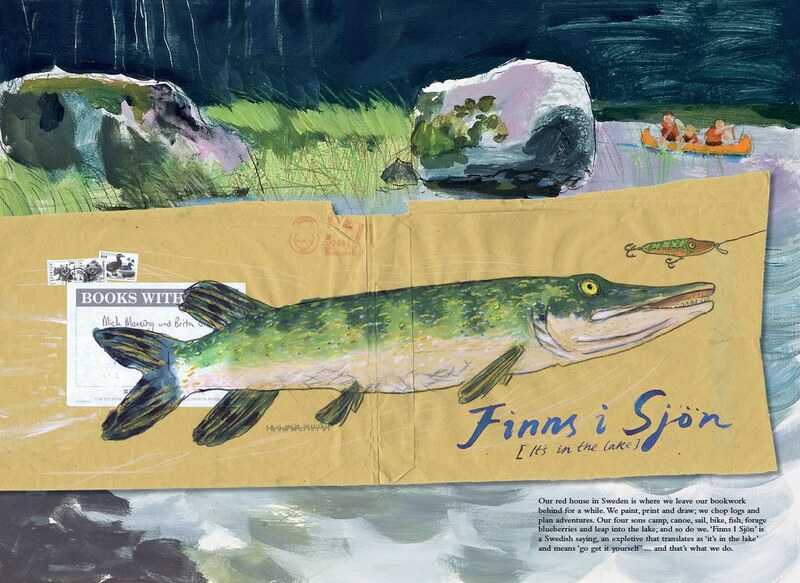 The next issue is on its way, with an impressive roster of illustrators, designers and writers donating their time to the project – including Jonny Hannah, illustrator Ralph Steadman, Eye contributor Catherine Dixon, Mark Hearld and Emily Sutton (among others) alongside founders Simon and Angie Lewin (St. Jude’s). Spread from Random Spectacular no. 2 showing Rob St. John and Tommy Perman’s collaboration Water for Life. Music and video collaboration between Ultramarine and Heretic for Random Spectacular no. 2. Video design and direction by Studio Heretic. 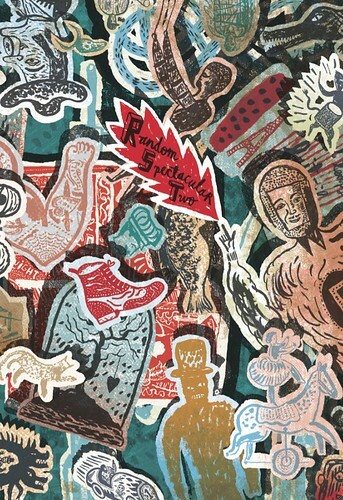 Cover illustration by Jonny Hannah, Random Spectacular no. 2, 2014. 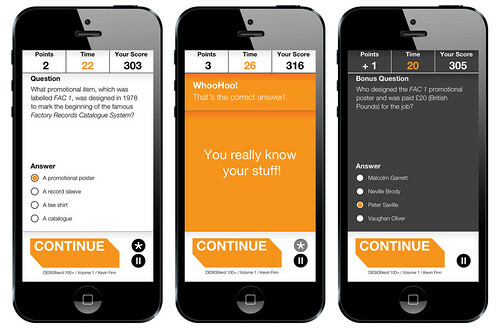 DESIGNerd 100+ is a series of apps and collectible playing cards designed by Kevin Finn (TheSumOf). Volume one’s questions are written by Finn, but two and three enlist the help of big design names from New York – Steven Heller with Lita Talarico and Stefan Sagmeister. DesigNerd 100+ apps, designed by Kevin Finn. 1. 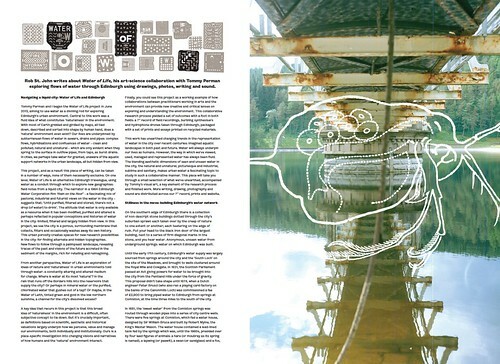 Dot Dot Dot magazine was co-founded by two designers. One of them was Peter Bil’ak. Who was the other designer? 2. In what year was the Nike swoosh logo, by Carolyn Davidson, designed? 3. Who designed the famous rainbow Apple logo? 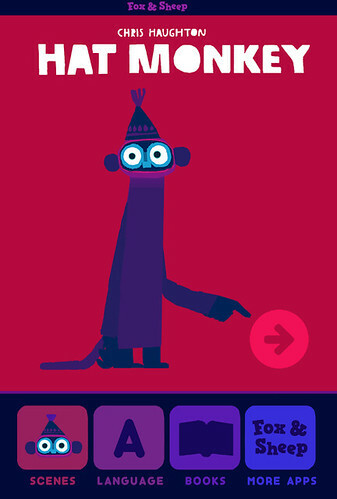 Hat Monkey app by Chris Haughton with music by Matt Wand. Hat Monkey is aimed at children under the age of six and the characters are non-verbal – they garble, dance, clap, read, hide behind furniture, play music and respond to the reader’s touch – though written questions prompt each new scene of the app. 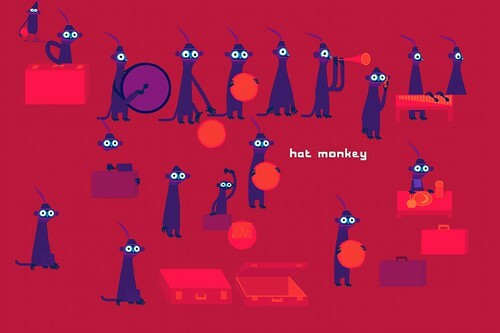 Hat Monkey is available in thirteen languages including Spanish, Russian and Japanese. You can read about the three-year making process on Haughton’s blog. Chris Haughton is also the founder of Node, a non-profit business that pairs illustrators and designers with Nepalese carpet weavers to produce beautiful fair-trade rugs (see ‘Node weaving’ on the Eye blog). Hat Monkey was published by Fox & Sheep, who also published Christoph Neimann’s Petting Zoo. See ‘Told in pictures’ in Eye 85. Monocle’s Mediterraneo no. 9 was released last month, the annual summer ‘superyacht-sized newspaper’ with the theme of ‘sun, sea and frolics’. The paper features illustrations by Laszlito Kovacs, Giacomo Bagnara, Alexis Nolla, and Japanese illustrator Cozy Tomato (aka Koji Tomoto), and takes the reader all over the world: to a perfumier in Barcelona; an open-air cinema in Greece; and a Music Forum Village in Rome. This issue includes a piece of short fiction by Anne Zouridi, a murder mystery set in the Greek Isles – the first time fiction has appeared in the magazine. Eye’s editor John L. Walters and and art director Simon Esterson recently spoke on Monocle Radio’s weekly show The Stack about Eye and other magazines, including Riposte, AA Files, Print Isn’t Dead and The Believer. You can listen to the 30-minute programme here. 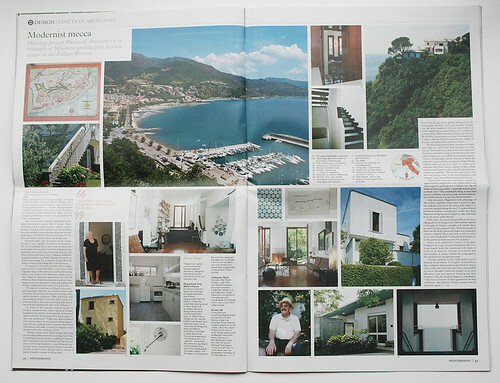 Spread from the design section of Monocle’s Mediterraneo no. 9 with photography by Gaia Cambiaggi that features the housing project Pineta di Arenzano designed by architects Ignazio Gardella and Marco Zanuso. 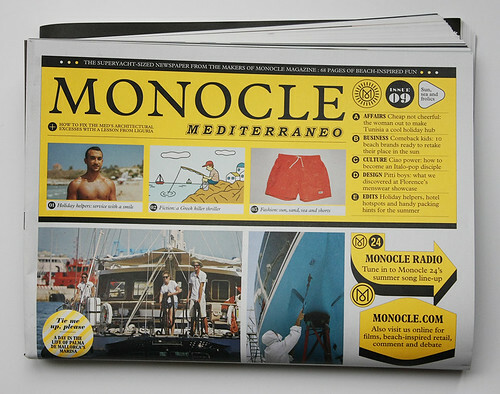 Monocle Mediterraneo ‘Sun, sea and frolics’ no. 9. Creative director: Richard Spencer Powell.